After spending a big chunk of the spring and summer reading nineteen books by the same author, I am now happily knocking off some YA titles. 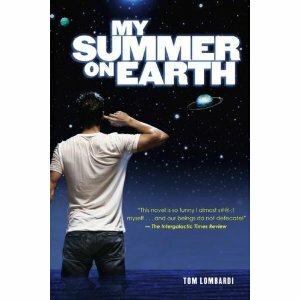 I stumbled upon My Summer on Earth by Tom Lombardi. Definitely an entertaining work that was easy to knock off. Clint--well, Clint Eastwood, a name our main character chose because it isn't douchey and because his human "suit" looks like Eastwood when he was young--is an alien on a mission to collect another alien who defecated (human humor--he means defected, of course) years before. The earlier alien is a well-known actor whose name we never learn because Clint always refers to him as the douche. While Clint works on completing his mission, he is involved with a long series of escapades because he doesn't understand Earth culture. He runs into a large number of douches and douche-like situations. The book is laugh-out-loud funny. Not only did I not get tired of hearing Clint say "douche," it actually became funnier the more he used it. I did wonder, though, if this book was really YA. Sure Clint is said to be a young alien in his own culture, and he's wearing an adolescent human suit. (Seriously. It is a suit. I won't tell you where he stashed his valuables. Use your imagination.) Plus there's a little father-son friction, though it feels sort of tacked on. In spite of all that, the book seems to be much more of an outsider-looking-in-on- human-culture story rather than a story about an adolescent making a transition to the adult world. Clint could have been any age. He didn't have to be a teenager. Plus a lot of the scenes seemed as if they belonged in a book for twenty-somethings. For instance, in one scene, Clint believes he's following a group of people into church but they're really going into IKEA. IKEA--very twenty something. YAs aren't all that into buying furniture. I think an equivalent for a YA book would be something similar to Best Buy, a place where they could purchase piles of technical crap. And then Clint complains to someone about humans worshipping in stores. Again, the realization that humanity isn't that terrific strikes me as something that happens in a twenty-something book. In my experience, an adolescent's response to hearing that humans worship in stores would be, "How do I become a member of that church?" I'm not saying that to be all jaded and diss teenagers, by the way. I think they're into material things in part because the adult world has exploited them commercially but also because buying mass quantities of junk is a way of helping them to define themselves. I am what I have. With luck, they'll outgrow it. Say, when they're twenty-something and realize that junk really is junk. But, anyway, I think those stereotypical YA books about girls going to the mall may be a little more realistic portrayal of teen culture than a book in which a pretend teenager realizes that worshipping at IKEA probably isn't a good thing. That is not to say teenagers--especially older teenagers who are getting close to being twenty-somethings--won't enjoy My Summer on Earth. After all, Clint is hoping to get himself some human loving and his idea of human language involves large quantities of obscenity. But, you know, they could have read it if it had been classified as an adult book, too, and then it could have been marketed to adults as well. Swearing In Kids' Books--They're For It! Can You Believe It? National Punctuation Day? Lord Byron For The Young? How About Joan Of Arc, Zombie Hunter? I Almost Missed "I Can Read"